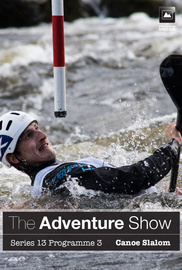 The team take to the stunning white water of the River Tay, at Grandtully near Aberfeldy, the home of Scottish paddling. The team take to the stunning white water of the River Tay, at Grandtully near Aberfeldy, the home of Scottish paddling. This year the racing is bigger and better than ever before because we're here for the inaugural Adventure Show Super Cup, with Olympic gold medallist Tim Baillie, from Aberdeen, giving an expert's view on the action. Also, Deziree Wilson discovers Scotland's most select running club, and we catch up with endurance athlete Katie Ford to see if she can create a new cycling record whilst living with epilepsy. And Cameron McNeish is back with a wild walk in Highland Perthshire.